SSU celebrates its 120th anniversary this year. 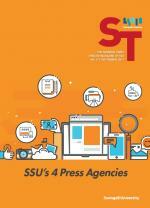 The four press agencies of SSU will hold a press festival for two days on the 21st and 22nd of September. The four media organizations here are The Soongsil Times, SSIZEN.NET, SSBS, and Soongsil University Newspaper. These agencies each have a long history, and they have been working for many years to provide information about the school to the students and faculty, as well as outsiders. The four organizations are located on the second floor of the Student Union, and each of them have their own distinctive characteristics. SSU’s English magazine, The Soongsil Times, was established in 1982. It publishes an issue four times a year (March, June, September, and December) and it is located at the Student Union Room 206. The magazine contains news both from inside and outside the SSU campus. The cub reporters write brief pieces on school activities and other internal affairs, while the reporters mainly write about issues from outside. After the magazine is published, The Soongsil Times distributes it to the Soongsilians and sends it outside the campus, including the alumni group, as well as other universities and high schools all over Seoul. The Soongsil Times has three departments: the news department, the photo department, and the culture department. The news department checks that the articles are properly uploaded, or if the reporters have made a mistake in formatting the article. The photo department covers the image sources that are attached to the articles. They are also in charge of the layout. The culture department plans events such as the anniversary of the first issue. Park I’m Park Chan-ju, and I am the Editor-in-Chief of The Soongsil Times. In 2015, I entered The Soongsil Times and worked as a cub reporter. I became a photo editor for The Soongsil Times in 2016. ST What is The Soongsil Times and how was it established? Park The Soongsil Times is an English magazine that is published quarterly. In the past, it was published in the form of a newspaper. However, it is currently being published in the form of a magazine. We have around 20 members. Our cub reporters are trained, and then six months later, they are required to take the reporter exam. Most reporters take part in The Soongsil Times until their junior year. ST Is there an event planned every year at The Soongsil Times? Park One major event is conducted per semester. The first event is the athletic meeting, wherein the alumni group members and incumbent reporters gather together, talk about the magazine, and play games. The second event is the anniversary of the first issue, and it is our main event. In addition to these events, we opened a booth that can communicate with the Soongsilians. We provide information about The Soongsil Times, and where our magazine is distributed. ST Is there anything else that you would like to tell the Soongsilians? Park At first, the Soongsilians did not know where to find our magazines. They are distributed at the entrance of SSU’s buildings. You can pick up our magazines any time before you go to class. We have a special section called STUDENT ESSAY, through which students can write directly to SSU. There is also a quiz at the back of the magazine. If you read our magazine and give us the correct answer, you will be rewarded with a small gift. A press festival is going to be held this September, and it will be hosted by the four media organizations of SSU. The Golden Ticket can be found in The Soongsil Times. We are giving away presents to the readers who can bring to us the golden ticket from our magazine. Did you see the relay screen of SSU events or the video that was playing in the Jo Man SikMemorial Hall or Student Union? SSIZEN.NET, which is the combination of the words ‘Soongsil’ and ‘netizen’, is the internet broadcasting station of SSU that offers various contents to Soongsilians. SSIZEN.NET sends video clips to Facebook and YouTube so that more students can watch SSU’s events in real time. They create various video clips when they do not have a relay schedule. During the semester, they assemble a production team who create web dramas, empathy videos, news, and documentaries. The Soongsil University Video Festival (SUVF) is hosted by SSIZEN.NET during the second semester. They prepare intensively in order to have a successful SUVF. Most notably, they create lengthy videos to screen during the festival. The video characters and format differs each year depending on the team leader. This year, they are going to prepare a media festival to celebrate the 120th anniversary of SSU. In 2000, it started as the Internet Broadcast Center SSIZEN.NET, and it was changed to Internet Broadcasting Network in 2004. It is located at the Student Union Room 202. Choi My name is Choi Sa-rah, and I am the 18th Editor-in-Chief of SSIZEN.NET. I am also a Soongsilian, majoring in Creative Writing. ST How was SSIZEN.NET established? Choi SSIZEN.NET is composed of 24 members. Each of us must work for two years. The first-year members participate in various projects as trainees. This process helps them improve their ability to create high quality videos and adapt to SSIZEN.NET. The second-year members educate the first-year members, and they attend various events as staff. They are in charge of substantive tasks. The third-year members assume an important position, such as the Director. Choi There are only two things that I ask of Soongsilians. First, please remember the name of SSIZEN.NET. Second, please watch our video clips. We are constantly trying to create better videos with higher quality. You can see the SSIZEN.NET videos on our website (ssizen.net), Facebook, and YouTube channel (SSIZEN.NET). In 1971, SSBS was created as the representative broadcasting station of SSU. SSBS was originally known as SCBS when it was first established. In the 1980s, it was changed to SSBS, which means Soongsil University Broadcasting System. It is currently located at the Student Union Room 201. SSBS is working on creating audio and video broadcasts. It broadcasts audio three times a day – morning, mid-day, and evening - during the semester. This is a regular broadcast and the subject of the broadcast varies from hour to hour. In the morning, SSBS broadcasts weather and school news. They deliver the story of everyday Soongsilians and accept song requests similar to a general radio program during lunch. If you want to send your story and song request for an audio broadcast, you can leave a message at the SSBS official homepage. During the evening, SSBS News reports information regarding happenings both inside and outside the school. SSBS audio broadcasts can be heard anywhere on campus. The video broadcast of SSBS can be seen on TVs located on the 3rd floor of Jo Man Sik Memorial Hall and the Student Union. Video broadcasting is composed of entertainment, documentary, and drama. These videos are shown each month. SSBS also provides promotional videos of on-campus events. ST interviewed the director of SSBS to learn more about the broadcasting station. The interview is as follows. Lee I am Lee Eun-bi, the director of SSBS at SSU. My major is Korean Language and Literature. ST What is SSBS and how was it established? Lee SSBS consists of 29 people: the director, 15 reporters, and 13 cub reporters. We create videos for various events, entrance ceremonies, and graduation ceremonies. ST What is special about SSBS? Lee I think what makes SSBS special is its audio broadcasting. You can listen to the broadcast or watch it while walking around campus. In addition, the university requests us to broadcast school nnouncements to the students, so that they may be informed. In other words, the greatest differentiation is that we provide important information via live broadcast. Lee Sometimes, there are students who consider our broadcast unpleasant noise. However, our broadcast contains important information. We are trying to satisfy as many students as possible. Please listen to our broadcasts as well. On April 4, 1919, SSU published the first university newspaper in Korea, the Soongsil University Newspaper (SUN). The SUN is the representative newspaper of SSU. It publishes newspapers every Monday throughout the semester, except for two weeks during the midterm and final examinations. In other words, SUN publishes 11 newspapers in one semester and 23 newspapers (including graduation newspapers) in a year. The newspapers are not published during the summer and winter vacations, during which the journalists are preparing for the next semester. SUN consists of eight sections, including the university section, the interview section, etc. It deals with the on-campus and off-campus events during the week, and provides useful information to students. As a result, SUN is helping the school and the students communicate with each other and is serving as a forum for public opinion. The SUN is currently located on the second floor (Room 207) of the Student Union. ST interviewed the director of SUN to find out more about the newspaper. Additional information can be found in the following interview. Shin I am Shin Ji-min, and I am the director of the SUN. I have been a reporter for the SUN since 2016. ST What is SUN and how was it established? Shin SUN was founded in 1912 as the first college newspaper in Korea, and it celebrated its 98th anniversary this year. It has a long history compared to other university newspapers, and the volume of circulation varies greatly. SUN is currently comprised of two reporters and one cub reporter, thereby consisting of three people in total. ST What is special about the SUN? Shin What is special about SUN is that we try to write articles from an objective viewpoint, while focusing on events that are taking place inside the campus. It is the same for all other newspapers, but our newspaper has three whole pages dedicated to campus affairs. ST Is there an event planned every year by SUN? Shin There is no event that we plan on our own. However, for the first time in years, four media organizations are going to prepare a festival in celebration of the 120th anniversary of SSU. Shin We are doing our best to provide good quality articles for you. I hope that you will pay attention to our articles and read them. Thank you.